It is often thought that older adults have little knowledge of or interest in technology or the internet. In a generation that did not grow up with smartphones or computers, many elders do express some hesitation around relying on technology. Yet, as the Baby Boomer generation ages, an increasing number of older adults are actively utilizing technology to reduce isolation, manage health conditions, and connect with vital information. 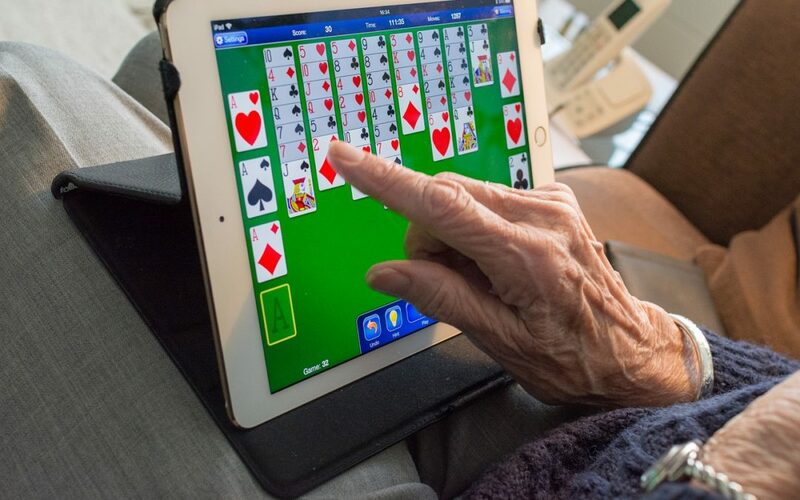 Technology is drastically changing the experience of aging in the United States by improving access to information, care, and social connections. In the National Council on Aging’s United States of Aging Survey, 84% of seniors cited technology as important to their ability to connect with the world around them. However, many seniors reported struggling with the costs of access (47%) and understanding how to operate devices (48%). Social Isolation: Older adults face an increased risk of loneliness and social isolation. Utilizing social media can help people stay connected or reconnect with friends and family. Using video chat outlets such as Skype or Facetime can allow one to communicate face-to-face with others without having to travel. Additionally, there are discussion groups available on the internet, such as the AARP Online Community, that can help older adults to connect with new people who share their interests. Mental Health: Maintaining social connections through technology can also alleviate depression by helping older adults to cope with changes in physical ability and mobility. Online support groups, or even online therapy, can help individuals to more effectively care for their mental health. Online forums and resources are also available to caregivers and individuals who have experienced loss. Memory and Cognition: Computer and phone games can be a fun way to increase hand-eye coordination and concentration. Scientists have even found that some video games can improve memory and cognitive sequencing ability in people over 65. Virtual gaming such as Wii bowling is often available at Senior Centers and can provide older adults with community as well as offer light exercise. AARP offers free “Brain Games” on their website that aid memory and cognition. Promoting Healthy Lifestyles: There are thousands of apps and websites that can benefit older adults. There are phone apps that can help people monitor their exercise and track their diets. Others can set medication reminders, list emergency contacts, and keep track of medical appointments, helping older adults to manage their schedules and wellness. In the fast-paced world of 2019, technology updates daily. While the internet contains a host of positive information, it is always important to navigate technology as safely as possible. Stick to reputable sites: Relying on well-known websites is more important than ever in today’s era of “fake news.” It is important to always double check the source of the information you are receiving online. Protect your Identity: Try to set unique passwords that you keep private. Adjust the privacy settings on your social media accounts and mobile phones in order to control who has access to your personal information. Also, avoid clicking on links that offer or request money – these are usually scams or viruses. Make your technology more age-friendly: There are several ways to make navigating technology easier, such as increasing the text size and volume on computers and phones. Practice, Practice, Practice: Just like any skill, technology proficiency does not simply appear. Practicing will go a long way in learning how to utilize various devices. Senior centers occasionally have courses to help people become more familiar with technology. Computers and smartphones are expensive. Luckily, there are LGBT-friendly locations throughout Philadelphia that offer free and discounted access to older adults! Free Libraries: The Free Library of Philadelphia consists of over 50 branches, each with free internet access to Library users. The Parkway Central Library offers technical assistance through Senior Services 9 am-5pm, Monday-Friday. Address: 1901 Vine Street, First Floor West, Philadelphia PA 19103. William Way LGBT Community Center: The David Bohnett Cyber Center at William Way has desktop computers for use at $1 per 15 minutes and free Wi-Fi. Call 215-732-2220 for Senior rates. Address: 1315 Spruce Street, Philadelphia PA 19107. Julia Tich is a Master of Social Work (MSW) at the University of Pennsylvania School of Social Policy and Practice. She is an intern with the LGBT Elder Initiative where she works to support LGBT older adult communities in Greater Philadelphia. To learn more about the LGBT Elder Initiative, visit www.lgbtelderinitiative.org.